The White Lion Leadership Academy is a six-week intensive held annually on site at the White Lion Heritage and Scientific Research Center in the heart of the White Lions' ancestral territories. Participants come from all walks of life and all corners of the earth. The purpose of the program is to inspire and empower participants to embody White Lion leadership principles, and improve their own intellectual, emotional, and physical well being, as well as the well being of the planet. 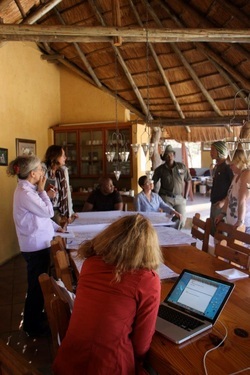 Incorporate White Lion leadership principles into existing careers and disciplines, whether it is in conservation and philanthropy, business or community development, education, therapeutic, or spiritual practices. Improve personal intellectual, emotional, and physical well being. Become an accredited White Lion Leadership practitioner, qualified to take effective empowered action, teach these methods, facilitate bringing and leading groups to the White Lion Heritage Site, and more.